To facilitate the export of queen bees and packaged bees to countries sensitive to a range of bee pests and pest bees. This program will provide technical, evidence based, information to support Australia’s pest free status claims during export negotiations and will assist exporters in meeting export certification requirements. To act as an early warning system to detect new incursions of exotic bee pests and pest bees. This greatly increases the possibility of eradicating an incursion, and limits the scale and cost of an eradication program. The program is jointly funded by the Australian Honey Bee Industry Council, Horticulture Australia Ltd, Rural Industries Research and Development Corporation and the Australian Government through the Department of Agriculture and Water Resources. In-kind contributions for the implementation of the program are provided through each state and territory Department of Agriculture as well as volunteer beekeepers. 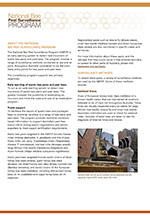 At a national level, Plant Health Australia coordinates and administers the program. This summary document includes the objectives of the program, the pests targeted, methods used for surveillance and the sources of funding.